Ms. Mulligan is the Administrator and Chief Operating Officer at Noble Horizons in Salisbury, CT and has been in this position since 1974. Noble Horizons is a not-for-profit retirement village owned and operated by Church Homes, Inc. of Hartford and offers four levels of living options for older adults ranging from independent to full nursing service. She is also Vice President of Church Homes, Inc. Prior to this she worked as Director of Public Relations at Saint Joseph’s Manor in Trumbull, CT from 1968-1974. 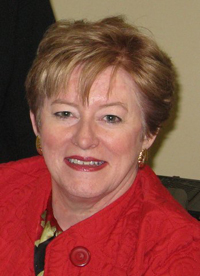 Among her many civic and community involvements, Ms. Mulligan has served on the Salisbury Bank Advisory Committee until 2010 and has been a member of numerous boards including the Salisbury Visiting Nurse Association, Salisbury Housing Committee and Faith House Council. She is currently on the board of the Maplebrook School and is a member of the Capital Campaign and Building Committee of St. Mary’s Church. She received a Bachelor of Science in Health Service Administration with High Honors from Quinnipiac College in Hamden, CT in 1974.